Because construction damage can affect the structure and stability of a tree, your arborist should check for potential hazards. A hazard check may involve a simple visual inspection, or instruments may be used to check for the presence of decay. If a hazard is found, sometimes it can be reduced or eliminated by removing an unsafe limb, pruning to reduce weight, or installing cables or braces to provide structural support. An often overlooked method of reducing hazards is to move objects that could be hit or to limit access to the hazardous area. If there is doubt about the structural integrity of a tree or the hazard cannot be adequately reduced, it should be removed. Although the goal is to preserve trees whenever possible, that goal must not supersede any question of safety. Branches that are split, torn, or broken should be removed. Also, remove any dead, diseased, or rubbing limbs from the crown of the tree. Sometimes it is necessary to remove some lower limbs to raise the canopy of a tree and provide clearance below. It is best to postpone other maintenance pruning for a few years. It used to be recommended that tree canopies be thinned or topped to compensate for root loss. There is no conclusive research to support this practice. Thinning the crown can reduce a tree’s food-making capability and may stress the tree further. It is better to limit pruning in the first few years to hazard reduction and the removal of deadwood. Do not top the trees. Trees growing in wooded areas are usually not a threat to people or structures. Trees that are close to houses or other buildings must be maintained to keep them structurally sound. If branches or tree trunks need additional support, a professional arborist may be able to install cables or bracing rods. If cables or braces are installed, they must be inspected regularly. The amount of added security offered by the installation of support hardware is limited. Not all weak limbs are candidates for these measures. Often the bark may be damaged along the trunk or major limbs. If that happens, remove the loose bark. Jagged edges can be cut away with a sharp knife. Take care not to cut into living tissues. Wound dressings were once thought to accelerate wound closure, protect against insects and diseases, and reduce decay. However, research has shown that dressings generally do not reduce decay or speed closure and rarely prevent insect or disease infestations. Most experts recommend that wound dressings not be used. If a dressing must be used for cosmetic purposes, use just a thin coating of a nontoxic material. One of the most important tree maintenance procedures following construction damage is to maintain an adequate, but not excessive, supply of water to the root zone. If there is a drainage problem, the trees will decline rapidly. Improper drainage must be corrected if the trees are to be saved. If soil drainage is good, be sure to keep the trees well watered, especially during the dry summer months. A long, slow soak over the entire root zone is the preferred method of watering. Keep the top 12 inches moist, but avoid overwatering. Avoid frequent, shallow watering. Make sure surface water drains away from the tree. Proper irrigation may do more to help trees recover from construction stress than anything else you could do. One of the simplest and least expensive things you can do for your trees may also be one of the most effective. Applying a 2- to 4-inch layer of organic mulch such as wood chips, shredded bark, or pine needles over the root system of a tree can enhance root growth. The mulch helps condition the soil, moderates soil temperatures, maintains moisture, and reduces competition from weeds and grass. The mulch should extend as far out from the tree as practical for the landscape site. (If the tree had a say, its entire root system would be mulched.) Do not apply the mulch any deeper than 4 inches, and do not pile it against the trunk. Compaction of the soil and increases in grade both have the effect of depleting the oxygen supply to tree roots. If soil aeration can be improved, root growth and water uptake can be enhanced. A common method of aeration of the root zone involves drilling holes in the ground. Holes are usually 2 to 4 inches in diameter and are made about 3 feet on center throughout the root zone of the tree. The depth should be at least 12 inches but may need to be deeper if the soil grade has been raised. Sometimes the holes are filled with peat moss, wood chips, pea gravel, or other materials that maintain aeration and support root growth. This process is called vertical mulching. More recent research has shown promising results with another method of aeration called radial aeration. Narrow trenches are cut with a compressed air gun in a radial pattern throughout the root zone. These trenches appear similar to the spokes of a wagon wheel. It is important to begin the trenches 4 to 8 feet from the trunk of the tree to avoid cutting any major support roots. The trenches should extend at least as far as the drip line of the tree. If the primary goal is to reduce compaction, the trenches should be about 8 to 12 inches in depth. They may need to be deeper if the soil grade has been raised. The narrow trenches can be backfilled with topsoil or compost. 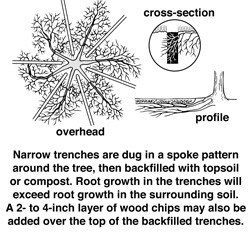 Root growth will be greater in the trenched area than in the surrounding soil. This treatment can give a tree the added boost it needs to adapt to the compacted soil or new grade. Vertical mulching and radial trenching are techniques that may improve conditions for root growth. If construction-damaged trees are to survive the injuries and stresses they have suffered, they must replace the roots that have been lost. Most experts recommend that you do not fertilize your trees the first year after construction damage. 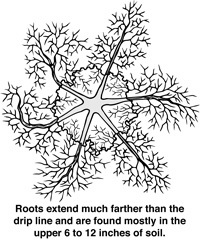 Water and mineral uptake may be reduced because of root damage. Excessive soil salts can draw water out of the roots and into the soil. In addition, nitrogen fertilization may stimulate top growth at the expense of root growth. It is a common misconception that applying fertilizer gives a stressed tree a much-needed shot in the arm. Fertilization should be based on the nutritional needs of trees on a site. Soils can be analyzed to determine whether any of the essential minerals are deficient. If soil nutrients are deficient, supplemental fertilization may be indicated. It is advisable to keep application rates low until the root system has had time to adjust. Despite your best efforts, you may lose some trees from the construction damage. Symptoms of decline include smaller and fewer leaves, dieback in the crown of the tree, and premature fall color. If a tree dies as a result of root damage, it may be an immediate hazard and should be removed right away. Examine your trees for signs of possible hazards. Look for cracks in the trunk, split or broken branches, and dead limbs. Watch for indications of internal decay such as cavities, carpenter ants, soft wood, and mushroomlike structures growing on the trunk, root crown, or along the major roots. 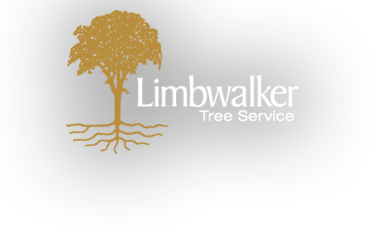 If you detect any defects or suspect decay, consult an arborist for a professional assessment. It is prudent to have your trees evaluated periodically by a professional. You should also inspect your trees for signs of insects or diseases. Stressed trees are more prone to attack by certain pests. Talk to your arborist about putting your trees on a program of Plant Health Care (PHC). Such a program may help identify and treat problems before they become a threat to the life of your trees.